Luxury Hotels in Budapest. Practical reviews. 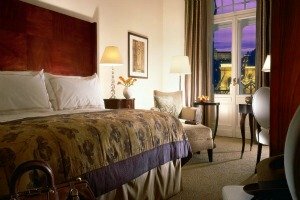 Luxury Hotels in Budapest are all in great locations and each one offers a unique style and concept of comfort and luxury. When searching for a luxury hotel in Budapest keep in mind what you really look for in a 5 star hotel: exceptional wellness and spa facilities ? great comfort, design and service? convenient location? neighborhood? or best panoramic views? We all expect to get it all in one. The good news is that in Budapest you can actually find some of these hotels. 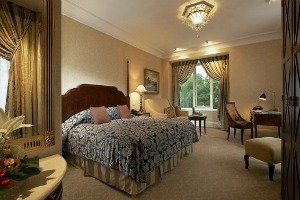 I have made a list of the Best Budapest Luxury Hotels based on friends’ experiences and travelers reviews. Hopefully it makes it easier for you to pick the hotel that suits the best to your interests. All Luxury hotels in Budapest are in beautiful and convenient spots of the city, they only differ in that some of them are located on the river bank and have spectacular panoramic views of the Danube, Buda Castle and Chain Bridge, while others are located in the city center so they lack the stunning views, specially at night. If money is no object undoubtedly stay in one of the best hotels with river view, you won’t regret it. Four Seasons Budapest or Gresham Palace outstands for its high level of service, grandour and architectural Art Nouveau beauty.It is in a great location near the Danube Promenade offering stunning views of the Chain Bridge, Buda Castle and Buda Hills. Four Seasons Budapest showcasts 179 well proportioned guest rooms including 17 suites that reflect the architectural heritage of Gresham Palace, each one beautifully decorated in Art Deco style. All rooms count with all the facilities of a world class 5 star hotel. Spacious and modern marble bathrooms (separate shower and bath), high quality linen, robes, and bath products. Helpful staff that take care of every detail to make sure you have a great stay. Every room has its own private step-out balcony offering nice views of private courtyards, the Old City or the Danube. Amenities include top of the class fitness facilities(plus an eternity pool) and a great restaurant that combines architectural Art Nouveau beauty with Mediterranean cuisine and Hungarian traditional dishes. Every corner and detail of this magnificent palace is classy and elegant. It is not an inexpensive hotel but truly it is worth every penny. To choose a Danube view room will make a big difference. Amazing views of Castle Hill and Chain Bridge from rooms facing the Danube river. Grandour and elegance in every detail. Four Seasons Budapest’s photos and comments from recent guests. The Corinthia Grand Hotel is centrally located on Elizabeth Boulevard (Erzsébet Körút) a main street in the heart of Budapest. It is close to Andrassy Avenue, Jewish Quarter and Liszt Ferénc Tér. This 5 star hotel is a mixture of luxury modern facilities and old-world grandour. It features one of the best spas of the city offering a beautiful Turkish steam bath, a swimming pool, top-notch saunas, 8 massage rooms and a wide variety of relaxation treatments. This Budapest Luxury Hotel delivers the highest level of service, style, and exclusivity. It features 441 guestrooms, including 98 suites tastefully decorated with a French elegance touch. Some of the rooms face the busy Erzsebet Boulevard , others the hotel’s atrium, the inner courtyards or Harsfa street. Corinthia Grand Hotel Budapest has several drinking and dining options, including the Rickshaw Restaurant (Asian specialties), the relaxing Le Bar, The Brassiere and Atrium Restaurant (French cuisine), the popular Bock Bistro (Hungarian food) and Szamos Marcipan Café (traditional Hungarian pastries) . Outstanding spa, one of the best of Budapest. Central Location. Within walking distance from Pest’s landmarks. Traffic noise in rooms facing Erzsebet Boulevard. Corinthia Grand Hotel Budapest’s photos and comments from recent guests. Le Meridien Hotel Budapest occupies a beautiful building previously called Adria Palace built in 1914. It is centrally located in the heart of Budapest, a short walk distance from Andrassy Avenue, the Danube Promenade, Vaci utca and the Jewish Quarter. Le Meridien Budapest features comfortable, spacious rooms with tasteful interior decoration in Art Deco Style . All accommodations offer large windows overlooking Elizabeth square or Deak Ferenc pedestrian street. This 5 star hotel is a combination of modern facilities and classic elegance. Contemporary fabrics, classic furnishings, and technology merge with many classical elements throughout the hotel. Le Meridien Budapest delivers high level of service, comfort, style, and exclusivity. Its amenities include the Adria Palace Bar (live jazz music), Le Bourbon Restaurant (first class French cuisine), a health club with swimming pool(covered with a glass roof), sauna, steam bath and a fitness room. This 5 star hotel has become a landmark in Budapest, in fact, this year it has been nominated to the World Travel Award in the Hungary’s Leading Hotel category. This hotel is home to presidents, celebrities and corporate executives. In 2006, George Bush stayed in Le Meridien. Very convenient location. Walking distance from Chain Bridge, Pest’s sights, metro junction and tourism information center. Free wired internet in rooms. Babysitting service at extra cost. Beautiful architecture and elegant atmosphere. 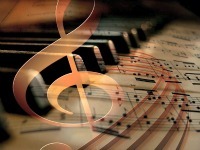 Live Jazz music in the bar everyday except Sundays. Expensive Wi-Fi internet in superior rooms. Le Meridien Budapest’s photos and comments from recent guests. 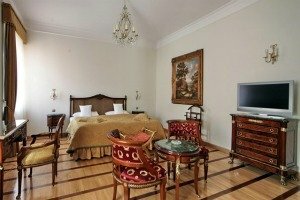 The St. George Residence Hotel is located in the beautiful area of Buda Castle District. It occupies the site of the famous 17th century Fortuna Inn. The Royal Palace, Matthias Church, the Fishermen’s Bastion and the Labyrinth are a very short walk away from the Residence. Although, it is not a central hotel, the peaceful and romantic Castle District ambience makes it a unique place to stay. The entire hotel recreates a stylish 18th century atmosphere.Its suites are divided into 4 categories: bronze, silver, gold and diamond. All of them are generously spacious and showcase classical elegance in every corner, they are large and well-equipped with kitchenettes and all modern facilities. The hotel’s restaurant features traditional Hungarian and International cuisine. St. George Residence offers free Wi-Fi in all rooms, the staff is very friendly and willing to help anytime. There are no fitness or spa facilities. Amazing classical and luxurious atmosphere. Complimentary water and Hungarian wine. Spacious rooms with lounge and equiped kitchenette. No fitness or spa facilities. No separate shower or curtain in bathtube. St. George Residence Hotel’s photos and comments from recent guests. The Kempinski Hotel Budapest is located in a beautiful spot in the heart of Budapest,within walking distance from Andrassy Avenue, Vaci utca, Fashion Street, the Danube promenade and Deák tér metro junction. 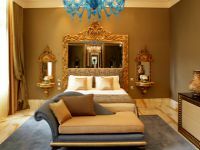 This luxury hotel offers 366 exceptionally spacious rooms including 31 suites fully renovated in classical and contemporary style. Each accommodation features upscale amenities, services and furnishings. Amenities include a great state-of-the-art spa, swimming pool and fitness area featuring Asian massage therapies. The hotel offers a variety of exclusive restaurants and bars within its own premises. The world famous Nobu restaurant is located at the Kempinski. Perfect location, great combination of luxurious accommodation and fine dining make the Kempinski Hotel Budapest a favorite place for business and leisure travelers. Great location. 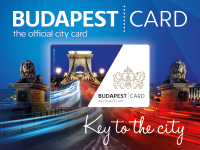 Walking distance from Chain Bridge,Pest’s sights, metro junction and Tourism info center. Free Wi-Fi internet in rooms. Great children hospitality (bathrobes, slippers and free milk at night). Tea and coffee facilities not available in all rooms. Pricy breakfast if not included in room rate. Kempinski Hotel Budapest’s photos and comments from recent guests. 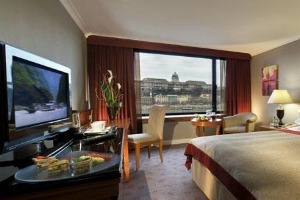 Intercontinental Hotel Budapest has the perfect location, right on the Danube river bank in Pest. 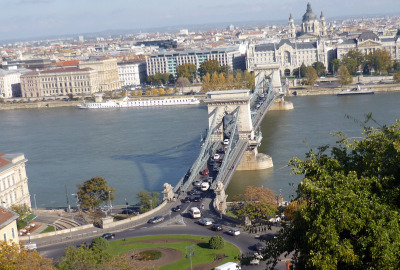 It offers the best Budapest’s panoramic views over the Chain Bridge, the Buda Castle and the Danube both day and night. Vaci utca, the Buda Castle District and the most popular of Budapest’s attractions as well as metro and tram stops are within walking distance from the hotel. Intercontinental Hotel Budapest offers 402 guest rooms, including 184 deluxe rooms and 18 suites decorated mostly in traditional style with a blend of contemporary and classical designs offering a great feeling of comfort and luxury. The hotel counts with great state-of-the -art spa facilities featuring 4 treatment suites, sauna, swimming pool, steam bath and a fitness center open 24 hours. All accommodations are fully equipped with functional and modern amenities including Satellite TV, Minibar, coffee and tea maker, high speed internet access(at extra charge), and in room movies(pay per view). Excellent location. Close from Chain Bridge and all main Budapest’s attractions. Breathtaking panoramic views specially at night. City’s best views of Buda Castle District, Danube ad Chain Bridge. Some rooms are small and seem due for an update. Inter Continental Hotel Budapest’s photos and comments from recent guests.